The border dispute involving China, India and Bhutan over the Doklam Plateau seems far from resolution. As we've been reporting a standoff between India's army and China's army on Doklam plateau in the tiny country of Bhutan. China is attempting to annex the region, and on June 16 sent Chinese troops and construction workers to begin road construction. Bhutan troops tried to prevent the Chinese troop incursion, but they were overrun. India sent in its own troops, saying that it did so when Bhutan invoked a treaty with India and asked for help. The result is a standoff, though no bullets have been fired yet. "On June 16, the Chinese side was building a road in the Dong Lang area which is located on the Chinese side of the Sikkim Sector of the China-India boundary. This was aimed at improving the local transportation and facilitating local herdsmen's grazing of livestock and border troops' patrolling. It is normal activity of China in its own territory which is completely lawful and legitimate." Unfortunately, it isn't "normal activity," and it isn't China's territory. It's Bhutan's territory. To make its point, China's military has carried out live fire exercises in Tibet, presumably near the Doklam region. A video on China Central Television (CCTV) showed a commander sitting in a vehicle shouting “3, 2, 1, fire!” into two telephones and a missile was launched into the sky. Troops were shown loading and firing other missiles, some of which landed in fiery explosions. Probably more significant is that a commentary in China's official Xinhua news agency said, "China has made it clear that there is no room for negotiation and the only solution is the unconditional and immediate withdrawal of Indian troops from the region." "India is publicly challenging a country that is far superior in strength. India's recklessness has shocked Chinese. 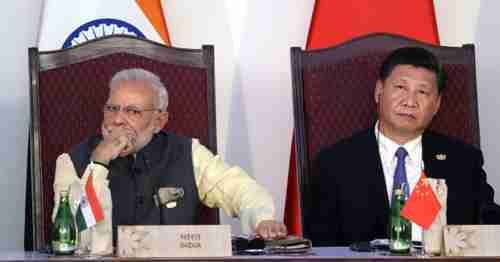 Maybe its regional hegemonism in South Asia and the Western media comments have blinded New Delhi into believing that it can treat a giant to its north in the way it bullies other South Asian countries. Over the past month, the People's Liberation Army (PLA) has been on the move. We believe that the PLA has made sufficient preparation for military confrontation. It is a war with an obvious result. The government of Prime Minister Narendra Modi should be aware of the PLA's overwhelming firepower and logistics. Indian border troops are no rival to PLA field forces. If a war spreads, the PLA is perfectly capable of annihilating all Indian troops in the border region." Indian authorities have said in the past that they are prepared for a military clash with China in Doklam, and that they expect to win. India's Ministry of External Affairs is using far more diplomatic rhetoric than China, but has not shown and inclination to back down. A spokesman said that India is continuously coordinating with Bhutan to arrive at a "mutually-acceptable solution" to resolve the Doklam dispute. He added, "Our objective is to achieve peace and tranquility through diplomacy." However, it's hard to see how war can be avoided unless India backs down. China's president Xi Jinping may be under pressure to resolve the situation as quickly as possible. The Communist Party congress is set for November. If the Doklam standoff continues until them, or if China's military withdraws, then it would make Xi look weak, and would bolster his rivals. From the point of view of Generational Dynamics, xenophobia and nationalism are increasing in countries around the world, as countries go deeper into a generational Crisis era. The result is that many countries are becoming more belligerent, at least in rhetoric. On the Arabian Gulf, the four Arab countries Saudi Arabia, Bahrain, United Arab Emirates, and Egypt have implemented a land, sea and air blockade against Qatar. This has gone on for weeks. As we reported two days ago, US Secretary of State Rex Tillerson said that China was risking "open conflict" with the US over its policies in the South China Sea and in Korea. His remarks were consistent with other statements by President Donald Trump and Senator Lindsey Graham. They represent a significant escalation in rhetoric by the US, and a change in policy that's consistent with a Generational Dynamics analysis. Another example is North Korea itself, which is exhibiting increased belligerence through development of ballistic missiles and nuclear weapons. On Wednesday, China's Foreign Ministry issued a 15-page document entitled: "The Facts and China’s Position Concerning the Indian Border Troops’ Crossing of the China-India Boundary in the Sikkim Sector into the Chinese Territory." It goes into detail about an agreement called the "1890 Convention Between Great Britain and China Relating to Sikkim and Tibet" to provide proof that the Doklam Plateau really belongs to China, rather than Bhutan. However, that was a colonial-era agreement between Great Britain and China. Bhutan was not a party to that agreement. We always run into the same problem with China. In the South China Sea, they're building artificial islands and military bases that are in violation of international law, and they've repeatedly lied to make their claim to annexing the entire South China Sea. If they've lied repeatedly about the South China Sea, why would anyone believe anything they say about the Doklam Plateau or anything else?